Tell Me a Picture offers a fresh and unique way to appreciate art without distraction. 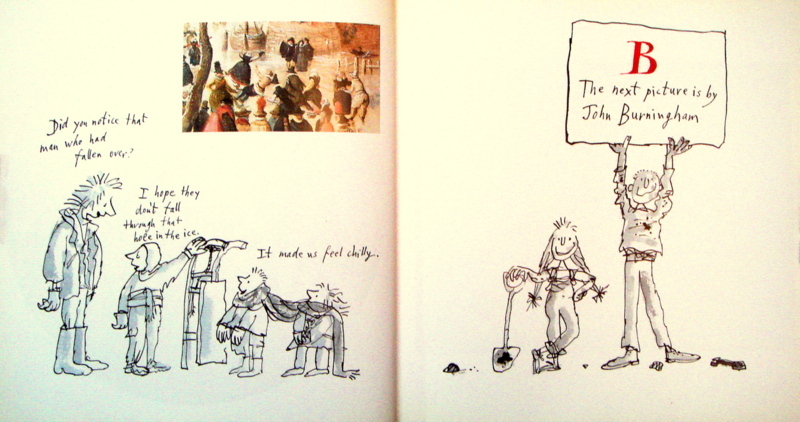 Quentin Blake is a British illustrator—he’s well known for his art in Roald Dahl’s books—and an author and cartoonist as well. He also writes and illustrates his own books. He is a frequent producer of quality work and has illustrated over three hundred children’s books, including Great Day for Up written by Dr. Seuss (and the first book that Seuss did not illustrate himself). Blake’s loose, lively style is totally unmistakable; he is able to communicate so much with a just few lines and a hint of color. His art is spirited and full of joy. I often marvel at the simplicity of it. He is a master of using deceptively simple drawings to convey complex actions and emotions. Blake began his career at Punch; his first drawings were published when he was sixteen. 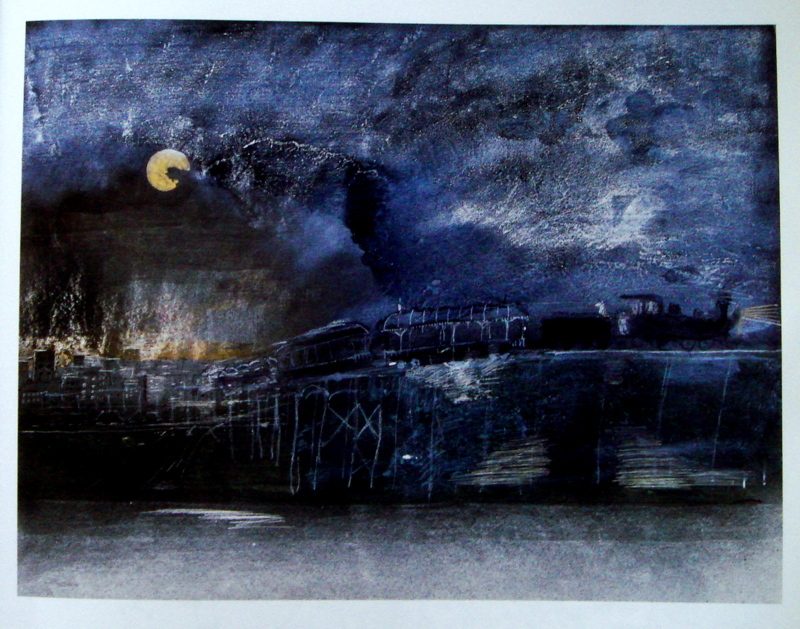 He was head of the Illustration department at the Royal College of Art from 1978 to 1986. He was appointed the first British Children’s Laureate and served from 1999 to 2001. In 2002, he was awarded the biennial Hans Christian Andersen Award for his career contribution to children’s literature. This year, Blake was knighted for his services to illustration. This is all to say, the man is respected and beloved by many. One of the appointed duties of the British Children’s Laureate is to raise the profile of writing and drawing for children “in whatever way the Laureate considers appropriate.” Blake decided to design an art exhibit at the National Gallery in London so that he could better communicate his belief that looking at great illustrations can be the first step in a life long appreciation of great art. 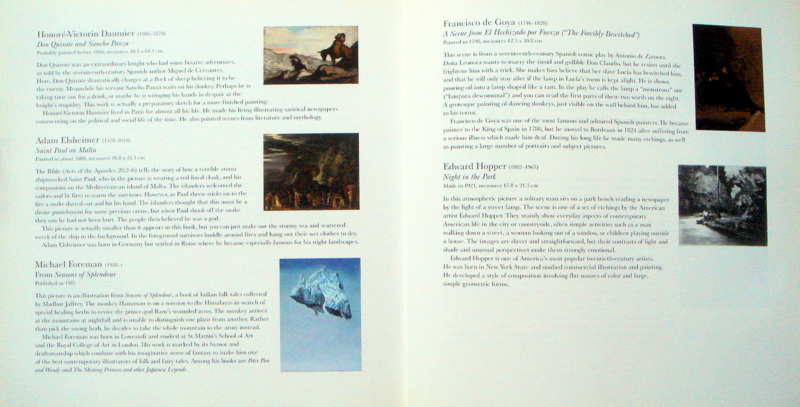 This book was published to accompany that 2001 exhibition of the same title. Tell Me a Picture features twenty-six paintings, each by a different artist and all chosen by Blake. The variety of artists is extraordinary. He includes old masters, modern illustrators and various artists in between; the earliest piece, by Paolo Uccello, was painted in 1460. Each painting is introduced by “an assorted crew of conversational children,” illustrated by Blake. Every piece of art is given its own two-page spread; this was done so that the reader could be alone with the art and absorb the image without distraction. The page following each piece features those conversational children and their thoughts and questions about the art that’s just been viewed, sometimes accompanied by a detail of the painting. At the end of the book, Blake offers a few more thoughts on viewing art and tips on viewing art with young children, as well as information on each painting and its artist. Tell Me a Picture offers a fresh and unique way to appreciate art and a fantastic way to introduce young children the myriad stories one painting can reveal. That’s wonderful to hear. Thank you for sharing! What a great book: thank you for reviewing it! What a fantastic read and another great focus piece on your blog. This sounds like a book that I can share with both my husband and two children. Thanks for sharing! Wow, this is a very unique way to present art to kids, and I like it! 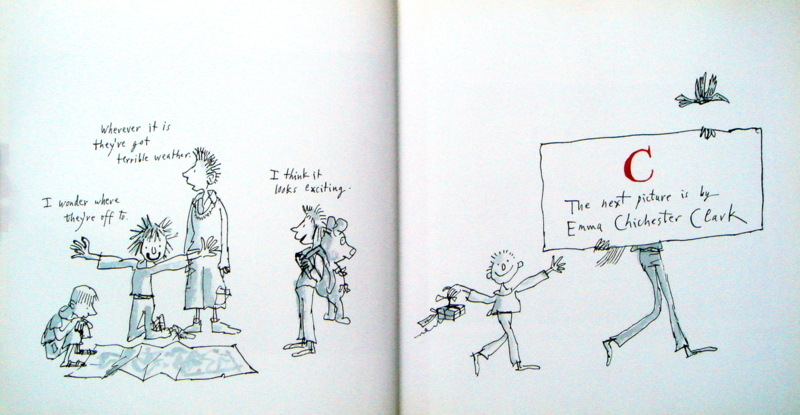 I had no idea he wrote his own books, but I immediately recognized his artwork from the Roald Dahl books. What a super book concept and presentation!Thanks for bringing into my view. Children’s Laureate – what a great idea!